Hand crafted Italian style meatballs laid upon a bed of Al dente pasta and covered with homemade tomato sauce. Served with Fresh Vegetable and garlic bread. Fresh 8oz Hand cut sirloin steak cooked to preference. Topped with a knob of Garlic and Chive compound butter. Served with fresh vegetable and choice of potato. 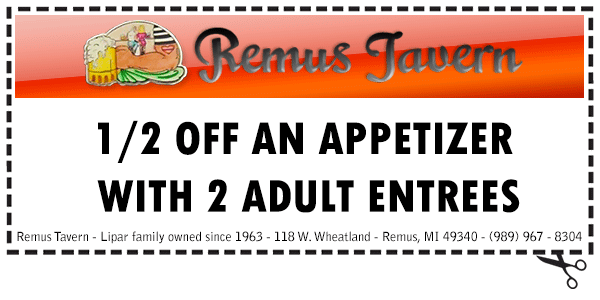 Remus Tavern voted Mid-Michigan’s Hockey town by Big Rapids Pioneer. A restaurant's name is established by means of quality food and service. At Remus Tavern, we strive to be the best at what we do. We cater to the working guys who come in for a quick bite for lunch or can host your golf outing or formal wedding party.